Gain insight into Xcelsius software for SAP, and how to configure its user-friendly and dynamic dashboards. Xcelsius software is a component within SAP BusinessObjects that has numerous features for making user friendly and dynamic dashboards. But while Xcelsius has all the functionality needed to create a dynamic dashboard, there are still challenges when it comes to configuring Xcelsius. In this section, learn the basics of Xcelsius software, and how to configure it so as to make the most user-friendly dashboard possible. Also learn about the Financial Analysis Calculator within an Xcelsius dashboard, and how it is used for extrapolations and forecasting models. 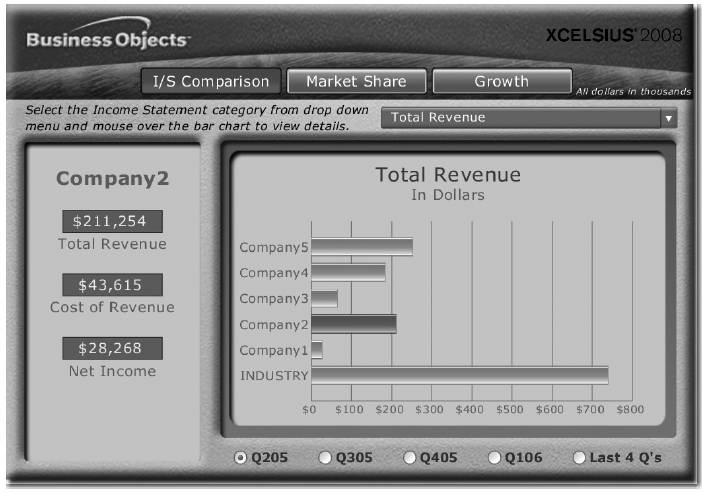 Xcelsius is the component with all the bells and whistles for dashboarding in the BOBJ environment. This toolset really takes the whole dashboarding process to another level. It has all the functionality that is required for a dynamic dashboard and it is very easy to use and understand. Now, that being said, it still requires that we configure the underlying source of data correctly so that the different indicators available can read the appropriate information. Xcelsius 2008 is a visualization tool for creating interactive visual models based on highly aggregated data sets. It uses a point-and-click design time environment that can easily be used by business users. No programming skills are necessary for creating Xcelsius 2008 visualizations, but knowledge about dashboarding is still a requirement. The following illustration shows the initial workbench for the Xcelsius product. As you can see, the object—Bar Chart—has been dragged and dropped into the worksheet. Notice to the right side of the screen you can see that very similar questions are being asked for the development and configuration of this chart type as were asked for the WAD. We've seen this information when we looked at the bar chart in the WAD component. So, what comes around goes around and as I mentioned nothing that you learn from the development of the chart types in the WAD will go to waste. The information such as subtitles, titles, categories, and so forth are the same and should be treated the same. 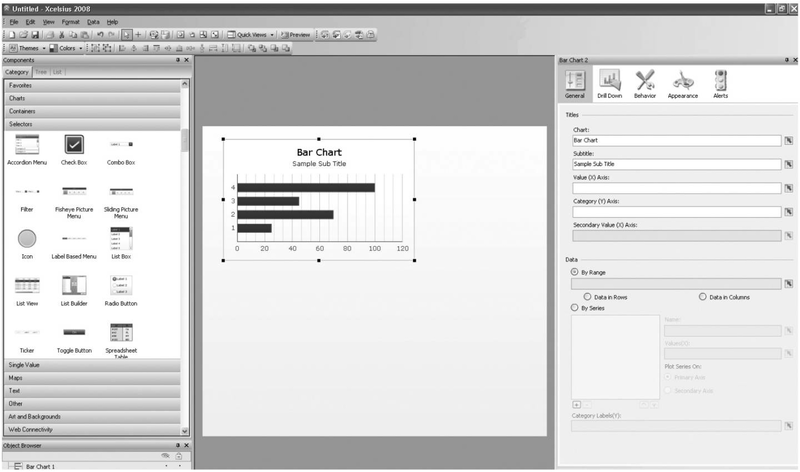 The different categories of charts and types are found on the left side of the screen. One advantage that Xcelsius has over the WAD is that it offers additional types of objects, some of which are shown on the left side of the preceding illustration. You can see that the ease with which you can use a Selector or a Tachometer, and its dynamic and robust displays separate the Xcelsius from WAD functionality. This component is very user friendly and is positioned to be used by the business users as well as the power users to develop the dashboards on the fly. As you can see, there is plenty to review and discuss when it comes to the configuration using Xcelsius, but for this general introduction, we are going to look at some of the possible results that you can achieve with Xcelsius. Also keep in mind that configuring an interactive "what if" statement is much easier in Xcelsius than using the WAD and Integrated Planning (IP), and can be accomplished by the business user rather than the BW IT department. All the features that are available in the other components are also available via Xcelsius, such as live data connectivity to KPIs, the ability to leverage the Excel modeling component (as shown in the preceding illustration, the worksheet can be an Excel worksheet), and, once you develop the dashboard, the ability to embed a dashboard into any Microsoft Office application, including PowerPoint presentations. You can display the developed dashboard via a portal, whether a BI portal or a corporate portal, and integrate SAP and non-SAP data into one dashboard. The integration of the SAP and non-SAP data still requires IT department assistance in most cases, but the integration of the data is much easier to work with and complete. When you are in the process of deploying Xcelsius for the enterprise, other considerations need to be taken into account in addition to all the guidance for OLAP universes and Web Intelligence. This is due to the fact that the OLAP universe is predominantly used as the backend for Xcelsius dashboards via the Query as a Web Service (QaaWS) component. Make sure that you pull in only the data that you absolutely need and must display in the dashboard. 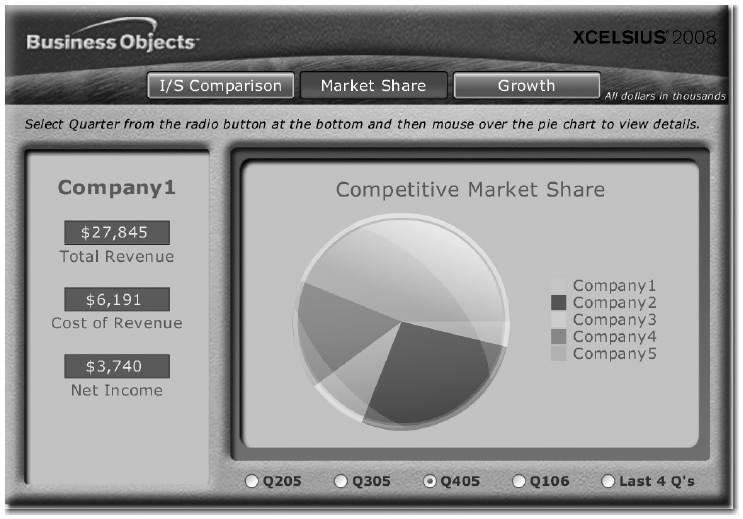 Xcelsius dashboards run within the Flash engine inside the browser, which is not designed for aggregating data, performing large mathematical calculations, or processing large data sets that require a large amount of memory. The guideline for data volume is to try to keep your data set ideally to 500 rows, 5,000 rows maximum. To guarantee fast response times, you may need to create highly specific BEx queries to base the universes on, and keep the universes small; or at the very least, keep the number of key figures low to increase query performance. Be smart in how queries are initiated. If the dashboard has multiple tabs, try to pull in data for subsequent tabs only when those tabs are accessed. Running all the queries on initial load can delay the moment the dashboard first displays, which may be longer than an end user is willing to wait. Splitting the queries up between tabs can make the dashboard far more responsive. Push aggregation down to BW. This is a proven and industry-standard strategy to keep the data sets small and make queries run fast. Expectations around the response of dashboards are very different from refreshing operational reports. Where a live query is not feasible, LiveOffice is a good option. However, the LiveOffice documents should also be optimized to ensure good dashboard performance. Ensure that you are on the latest patch levels for Xcelsius, BusinessObjects Enterprise (BOE), and BW. A number of product issues have been enhanced, so the latest Fix Packs provide all the resolutions for issues identified earlier. The Fix Packs are synchronized and rely on each other, so it is not sufficient to only patch the BOE servers or the BW system alone. So, let's look at some examples of the results of using Xcelsius. This is where you really see the difference between the WAD and Xcelsius. 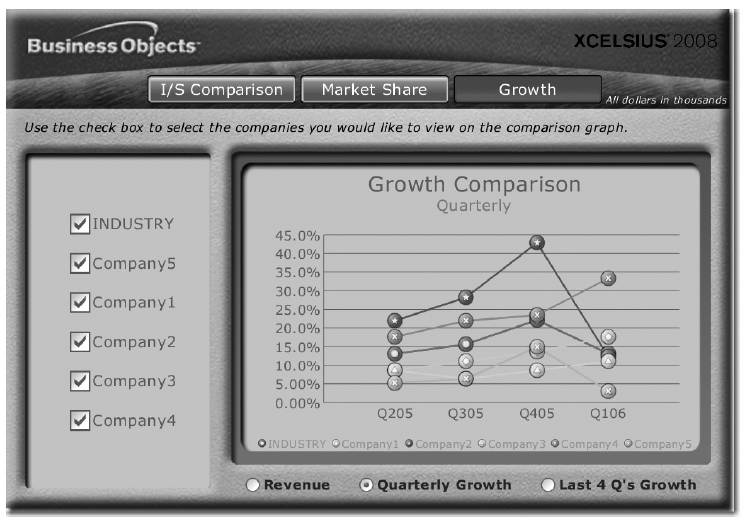 The following illustration shows a finished dashboard generated by Xcelsius functionality. The title of the dashboard is very straightforward—Annual Sales by Region vs Top Competitors. All the information fits on one screen, so the business user doesn't have to scroll to see additional information. Although we do have additional information included in this format such as future sales growth, we don't have to navigate around the screen to display. We can review the current actuals, then navigate to or execute a what-if analysis directly from the present screen. Very direct chart types enhancements are used. The dynamic component of this is that we can really see the difference in the coloring and highlighting that are available in this dashboard. The chart at the bottom right has a very interesting approach to showing the current actual sales versus the forecast sales. The same information is displayed using two different chart types in the same chart. It actually works in this case and shows a dramatic difference between the actual data and the forecasted data. This uses the concept that we talked about to draw the business users, attention to the critical KPI first before viewing the remaining information. All in all, this is a very direct, easy-to-read set of KPIs being displayed as a dashboard. The one additional function that is available using Xcelsius but not available with the WAD is the ability to move the "what-if" slider control to adjust the projected sales growth and see the information onscreen automatically adjust to the change. With the WAD and even the VC there is some functionality to allow us to execute this type of what-if analysis, but compared to the functionality available in the BOBJ components, these options are only about 75% of the level of interaction and this requires additional effort by the BI IT team to configure. In Xcelsius the functionality is standard for this component. You can see in the following illustration, the projected sales growth has been adjusted to 10.50%, with a corresponding shift of all the indicators. The following illustration demonstrates how the use of all the additional functionality available in Xcelsius can start to get us into trouble. As you can see, within this dashboard, we have the ability to show the forecast using the chart type radar. Can you figure the forecasted sales information within 20 seconds? It is possible but not as easy as in the previous dashboard. Even in this case, the ability for the chart type to shift with the changes using the what-if process is unique. The following illustration shows the result of moving the slider from 10.50% to 22.50%. The following illustration shows another example of what Xcelsius can do. The dashboard has three KPI screens and, instead of scroll bars, buttons are available at the top of the screen to support quick switching from one screen to another. The background formatting isn't too appealing, but if this is what the company is looking for, this can be done either in Xcelsius or using the WAD. As for the actual dashboard, you can see that each quarter is displayed individually, but the rightmost button enables the business user to see all four quarters in one screen. Clicking the Growth button at the top displays information for all four quarters for revenue growth. This changes the dashboard from three KPIs into a very straightforward dashboard with only one KPI—Total Revenue—and on the side three summarized values for Total Revenue, Cost of Revenue, and Net Income. This changes depending on what bar you click, and that information will show up on the left. Even though this dashboard has only one KPI, it demonstrates the ability to make a very basic dashboard useful and dramatic. 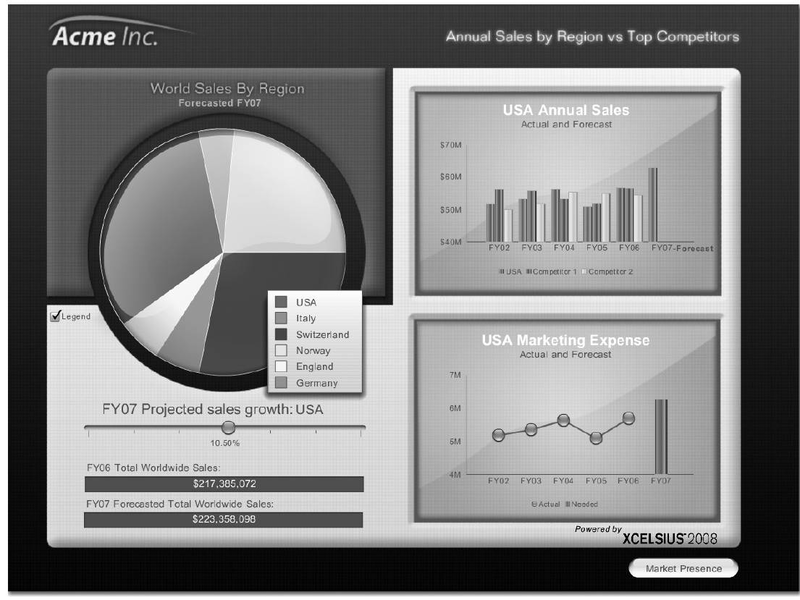 Each of the other two buttons also shows a basic chart type—one displays a pie chart and the other displays a line chart, as shown in the following two illustrations, respectively. 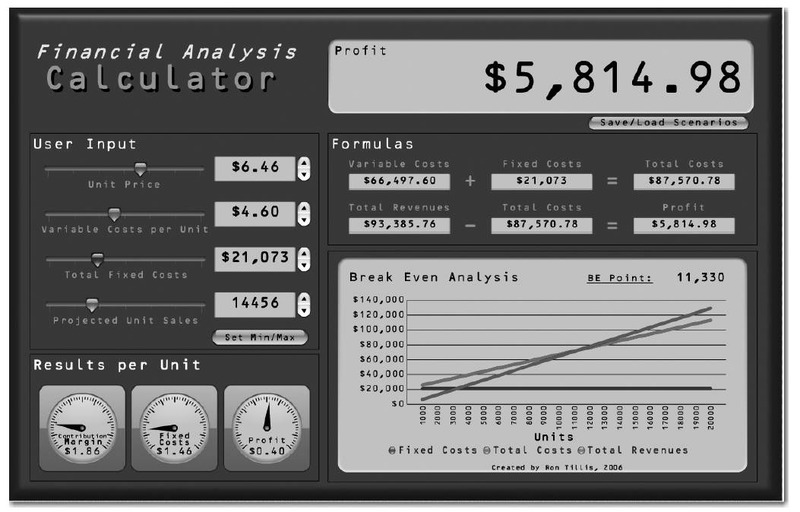 The final example, shown next, is a very different type of dashboard, a complete what-if calculator. The title is Financial Analysis Calculator. Therefore, it doesn't display any actual or real data to do any comparisons. This is to be used only for extrapolations and forecasting models. This is a very useful tool and, in the appropriate scenario, can be used to generate extremely valuable information to the overall inventory planning and budgeting process. In this case, none of the indicators are set and all can be adjusted and flexed to whatever positions the business analyst wants to review. As you can also see, the main goal of this analysis is to review the final Profit value, which takes up the most room on the dashboard and therefore should be the critical piece of information that we gather from this analysis.